3. Find out specific information about the past and make connections between the past and the present. A focus on personal feelings, family gathering, sharing, helping, and working together, giving thanks, and making and giving gifts to others is of primary importance for young children. 2. People make and use tools, now and in the past. 3. People cultivate and eat a variety of foods, and prepare them in a variety of ways. 4. People need clothing and wear a variety of clothing styles and materials. 5. People from different cultures have their own ways to celebrate holidays and may celebrate different holidays as well. People enjoy a variety of games, and have a variety of customs, but these customs often serve similar purposes. 6. People help each other when they share ideas and work together. 7. The places people live now did not always look the same way as they do now. 8. There are Native Americans now, as there were in the past; modern life is different for all of us. 9. Relatives of the Pilgrims live now; we live now and have relatives who lived in the past; and modern life is different for all of us. 10. Not everyone celebrates the same holidays we do. This year we began to stimulate ideas about the past by encouraging children to investigate tools and other objects made from materials found in nature near us. We talked about how these tools were made recently using materials that people who lived in our area long ago might have used too. Children created pretend games with homemade cloth and corn husk dolls that could travel in wood or bark canoes. They tried on necklaces made of dyed corn kernels and thought about how the vibrant colors used might have been found. They pretend cooked using wooden mortar and pestles, and used clam shells for scoops. They incorporated woven mats and baskets into games and pretend. We played instruments made from natural materials. 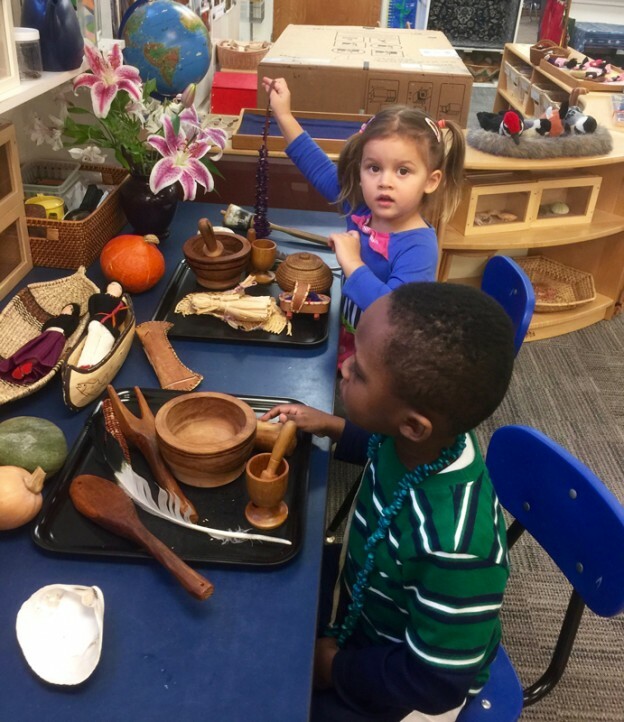 A rich display with diverse materials stimulates many connections to family experiences, and gives us opportunities to offer a sense of history in ways that are personally meaningful to the children. From that beginning, we offered activities that gave children opportunities to create their own materials. Could we use scraps from our beautiful easel paintings to weave? Could we dye our own fabric with something from nature? Could we learn games that use stones or other natural materials as props or tools? Could we create musical patterns using drums, shakers, or other instruments made from found materials? Could we use sticks to create designs, shapes or letters? Because the children enjoy books we can sing almost every day, we used a version of Over the River and Through the Woods (poem by Lydia Maria Child and illustrated by Christopher Manson) to strengthen connections between past and present. With each experience, children found more and more details in this book’s rich illustrations of things happening long ago and their own personal experience. Whether it is a trip to visit grandparents, foods at the table, games and outdoor experiences children enjoy in cold weather, or other details, repeated experiences with this songbook led to rich conversations about family experiences, and helped children understand that in the past people had similar feelings and experiences around family. Cooking and harvest themes are central to family celebrations, and we’ve been sharing recipes as well. The children all spend time investigating squash, tasting many varieties of apples, and watching the changes colder weather brings to our beans and other plants growing outdoors in the gardens. The whole school will be coming together for our own “feast” before we break for the Thanksgiving holiday, and every class has been busy making foods and gifts for everyone at school. The children are preparing apple sauce, a trail mix, and a vegetable-rich pasta salad to share at the feast. This offers children a way to anticipate together, and get ready for a special celebration. Each class has been preparing gifts for a school wide giveaway as well, This offers an opportunity to think about sharing resources, so that everyone in the school community receives something special from others. And it encourages children to work over time. This year we’ve been busy painting large clam shells, lacing, and preparing homemade bookmarks with beautiful results. Families have developed a school tradition that we share as well. A parent created a small “tree” in our welcome room where children can talk about what they are thankful for, make a mark or have a grownup write a message about it, and hang it on the tree. The children have enjoyed watching leaves and messages get added, and those that are writing for themselves have spent time creating their own messages for the tree with teachers as well. This has become a lovely tradition that informally gives children lots of time to reflect on what it means to be thankful and on the many people and things we have to be thankful for. We teachers had an opportunity to see that these experiences have been meaningful recently when we introduced a flannel board poem about giving thanks to our youngest children. In this story poem represented with pieces of felt, a child reflects on all the things to be thankful for – things we can hold, see, or hear. The focus of the poem is on good foods, and connections to the natural world. As each piece of felt was carefully placed on the board, the children were completely engaged and thoughtful. When the poem ended, there was a brief silence, and then children spontaneously began to share things they are thankful for in their own lives – family, activities shared, toys, and good foods. This entry was posted in Celebrations, Curriculum, Education and tagged children, curriculum, education, learning, preschool, social studies on November 19, 2017 by Katrina Selawsky.